Brief Encounter is a 1945 British romantic drama film directed by David Lean about British suburban life on the eve of World War 2, centring on Laura, a married woman with children, whose conventional life becomes increasingly complicated because of a chance meeting at a railway station with a married stranger, Alec. They fall in love, bringing about unexpected consequences. Brief Encounter was met with wide praise from critics upon its release, and is today considered to be among Lean's finest works. It has been credited as an important early work of realist cinema for its small scale and the lack of big-name stars in its cast. 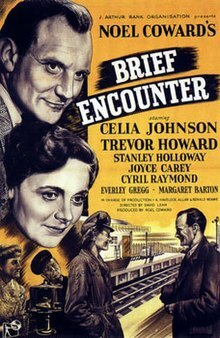 In 1999, the British Film Institute voted Brief Encounter the second greatest British film of all time. In 2017 a poll of 150 actors, directors, writers, producers and critics for Time Out magazine saw it ranked the twelfth best British film ever. The voice-over throughout the film is in the form of an unspoken confession from Laura to her husband. In the latter months of 1938, Laura Jesson, a respectable middle-class British woman in an affectionate but rather dull marriage, tells her story while sitting at home with her husband, imagining that she is confessing her affair to him. Laura, like many women of her class at the time, goes to a nearby town every Thursday for shopping and to the cinema for a matinée. Returning from one such excursion to Milford, while waiting in the railway station's refreshment room, she is helped by another passenger, who solicitously removes a piece of grit from her eye. The man is Alec Harvey, an idealistic doctor who also works one day a week as a consultant at the local hospital. Both are in their late thirties or early forties, married and with children. The two accidentally meet again outside Boots the Chemist and then on a third meeting decide to go for a small lunch, then, both having free time, go to an afternoon performance at the Palladium Cinema. They are soon troubled to find their innocent and casual relationship quickly developing into something deeper, approaching infidelity. For a while, they meet openly, until they run into friends of Laura and the perceived need to lie arises. The second lie comes more easily. They eventually go to a flat belonging to Stephen, a friend of Alec's and a fellow doctor, but are interrupted by Stephen's unexpected and judgmental return. Laura, humiliated and ashamed, runs down the back stairs and into the streets. She walks for hours, sits on a bench and smokes, and is confronted by a police officer, with the implication that she could be perceived as a "streetwalker". The recent turn of events informs the couple that both an affair and a future together are impossible. Realising the danger and not wishing to hurt their families, they agree to part. Alec has been offered a job in Johannesburg, South Africa, where his brother lives. Their final meeting occurs in the railway station refreshment room, now seen for a second time with the poignant perspective of their story. As they await a heart-rending final parting, Dolly Messiter, a talkative acquaintance of Laura, invites herself to join them and begins chattering away, oblivious to the couple's inner misery. As they realise that they have been robbed of the chance for a final goodbye, Alec's train arrives. With Dolly still chattering, Alec departs with a last look at Laura but without the passionate farewell for which they both long. After shaking Messiter's hand, he discreetly squeezes Laura on the shoulder and leaves. Laura waits for a moment, anxiously hoping that Alec will walk back into the refreshment room, but he does not. As the train is heard pulling away, Laura is galvanised by emotion and, hearing an approaching express train, suddenly dashes out to the platform. The lights of the train flash across her face as she conquers a suicidal impulse. She then returns home to her family. Laura's kind and patient husband, Fred, suddenly shows not only that he has noticed her distance in the past few weeks but that he has perhaps even guessed the reason. He thanks her for coming back to him. She cries in his embrace. The film is based on Noël Coward's one-act play Still Life (1936), one of ten short plays in the cycle Tonight at 8.30, designed for Gertrude Lawrence and Coward himself, and to be performed in various combinations as triple bills. All scenes in Still Life are set in the refreshment room of a railway station (the fictional Milford Junction). As is common in films based on stage plays, the film depicts places only referred to in the play: Dr. Lynn's flat, Laura's home, a cinema, a restaurant and a branch of Boots the Chemist. In addition, a number of scenes have been added which are not in the play: a scene on a lake in a rowing boat where Dr Harvey gets his feet wet; Laura wandering alone in the dark, sitting down on a park bench, smoking in public and being confronted by a police officer; and a drive in the country in a hired car. Some scenes are made less ambiguous and more dramatic in the film. The scene in which the two lovers are about to commit adultery is toned down: in the play it is left for the audience to decide whether they actually consummate their relationship; in the film it is intimated that they do not. In the film, Laura has only just arrived at Dr Lynn's flat when the owner returns and is immediately led out by Dr Harvey via the kitchen service door. Later, when Laura seems to want to throw herself in front of an express train, the film makes the intention clearer by means of voice-over narration. Also, in the play, the characters at the Milford station — Mrs Baggot, Mr Godby, Beryl, and Stanley — are very much aware of the growing relationship between Laura and Alec and sometimes mention it in an offhand manner, whereas in the film, they barely take any notice of them or what they are doing. The final scene of the film, showing Laura embracing her husband after he shows that he has noticed her distance in the past few weeks and perhaps even guessed the reason, is not in the original Coward play. Much of the film version was shot at Carnforth railway station in Lancashire, then a junction on the London, Midland and Scottish Railway. As well as a busy station being necessary for the plot, it was located far enough away from major cities to avoid the blackout for film purposes, shooting taking place in early 1945 before the Second World War had finished. At two points in the film the station location is indicated by platform signs referring to local destinations including, Leeds, Bradford, Morecambe and Lancaster. Noël Coward makes the station announcements in the film. The station refreshment room was a studio recreation. Carnforth Station still retains many of the period features present at the time of filming and remains a place of pilgrimage for fans of the film. However, some of the urban scenes were shot in London or at Denham or Beaconsfield near Denham Studios where the film was made. The country bridge where they twice go (including their final day) is Middle Fell Bridge at Dungeon Ghyll in Cumbria. The poem that Fred asks Laura to assist him with is by John Keats: "When I have Fears that I may Cease to Be". The quote Fred recites is, "When I behold, upon the night's starr'd face, Huge cloudy symbols of a high Romance...."
According to trade papers, the film was a "notable box office attraction". It was the 21st most popular film at the British box office in 1946. The film shared the 1946 Grand Prix at the Cannes Film Festival. At the 19th Academy Awards, Celia Johnson was nominated for Best Actress while David Lean was nominated for Best Director and Best Adapted Screenplay along with Anthony Havelock-Allan and Ronald Neame. Brief Encounter was acclaimed upon its release, although there were doubts that it would be "generally popular". It was voted one of the 10 greatest films ever made in two separate 1952 critics' polls. In 1999 the film was given the #2 slot on the British Film Institute's BFI Top 100 British films. Today, the film is widely praised for its black-and-white photography and the mood created by the steam-age railway setting, both of which were particular to the original David Lean version. The film was a great success in the UK and such a hit in the US that Celia Johnson was nominated for an Academy Award for Best Actress. Brief Encounter holds an 89% "fresh" rating at review aggregator Rotten Tomatoes. In 1999 it came second in a British Film Institute poll of the top 100 British films. In 2004, the magazine Total Film named it the 44th greatest British film of all time. Derek Malcolm included the film in his 2000 column The Century of Films. The British historian Thomas Dixon notes that Brief Encounter "has become a classic example of a very modern and very British phenomenon - weeping over the Stiff upper lip, crying at people not crying. The audiences for these wartime weepies could, through their own tears, provide something that was lacking in their own lives as well as those of the on-screen stoics they admired." Brief Encounter also loosely inspired "Mum's Army", an episode of the British comedy series Dad's Army. There is a similar final scene in a railway station. An episode of the British comedy series "Goodnight Sweetheart" mentions the movie, Noël Coward and there is also a similar scene in a railway station. Brief Encounter serves as a plot device in Mrs. Palfrey at the Claremont, a 2005 US-produced comedy-drama film based on the 1971 novel by Elizabeth Taylor. The aging widow Mrs. Palfrey reminisces that Brief Encounter was her and her deceased husband's favorite film, which leads her young friend, the writer Ludovic Meyer, to meet and bond with his eventual girlfriend. In the 2012 Sight & Sound polls of the world's greatest films, Brief Encounter received the votes of 11 critics and three directors. Frances Gray acknowledges a common criticism of the play: why do the characters not consummate the affair? Gray argues that their problem is class consciousness: the working classes can act in a vulgar way, and the upper class can be silly; but the middle class is, or at least considers itself, the moral backbone of society – a notion whose validity Coward did not really want to question or jeopardise, as the middle classes were Coward's principal audience. The film was released amid the social and cultural context of the Second World War when 'brief encounters' were thought to be commonplace and women had far greater sexual and economic freedom than previously. In British National Cinema (1997), Sarah Street argues that "Brief Encounter thus articulated a range of feelings about infidelity which invited easy identification, whether it involved one's husband, lover, children or country" (p. 55). In this context, feminist critics read the film as an attempt at stabilising relationships to return to the status quo. Meanwhile, in his 1993 BFI book on the film, Richard Dyer notes that owing to the rise of homosexual law reform, gay men also viewed the plight of the characters as comparable to their own social constraint in the formation and maintenance of relationships. Sean O'Connor considers the film to be an "allegorical representation of forbidden love" informed by Noël Coward's experiences as a closeted homosexual. On 30 October 2009, as part of the celebrations for the 75th anniversary of the BBC's Maida Vale Studios, Jenny Seagrove and Nigel Havers starred in a special Radio 2 production of Brief Encounter, performed live from Maida Vale's studio 6 (MV6). The script used was a 1947 adaptation for radio by Maurice Horspool, which had been in the BBC's ownership and had never been used or performed since then. In addition, there were two Theatre Guild On The Air broadcasts of Brief Encounter in its original form, Still Life. The first version aired on 6 April 1947 over ABC with Ingrid Bergman, Sam Wanamaker and Peggy Wood. The second one was presented over NBC on 13 November 1949 and starred Helen Hayes and David Niven. The Kneehigh Theatre production, produced by David Pugh and Dafydd Rogers, was adapted for the stage and directed by Emma Rice and is a mixture of the film and the stage play, with additional musical elements. It premiered at Birmingham Repertory Theatre in October 2007 and the West Yorkshire Playhouse later that month before opening in February 2008 at the Haymarket Cinema in London, which was converted into a theatre for the play. The 2008 London cast included Amanda Lawrence and Tamzin Griffin, with Tristan Sturrock and Naomi Frederick in the lead roles. The production ran until November 2008 and then toured the UK for 27 weeks from February to July 2009, with venues including the Oxford Playhouse, Marlowe Theatre and the Richmond Theatre and with the two leads played by Hannah Yelland and Milo Twomey. The US premiere at the American Conservatory Theater in San Francisco, CA ran from September to October 2009. The adaptation was performed in Brooklyn, New York at St. Ann's Warehouse in December 2009 and January 2010 and at the Guthrie Theater in Minneapolis in February – April 2010. The production returned to the UK, opening at Birmingham Repertory Theatre (where the production originally premiered) and The Lowry, Salford in February 2018 before returning to the Haymarket Cinema in London from March to September 2018. ^ "BBC - Cumbria - Cumbria 0n Film - Brief Encounter". bbc.co.uk. Retrieved 10 March 2016. ^ Whitaker, Brian (comp.) (1990). Notes & Queries. Fourth Estate. ISBN 1-872180-22-1. ^ "Hollywood Sneaks In 15 Films on '25 Best' List of Arty Britain". The Washington Post. 15 January 1947. p. 2. ^ "Brief Encounter (1945)". Turner Classic Movies, Inc. Retrieved 17 March 2017. ^ Huntley, John (1993). Railways on the Screen. Ian Allan. ISBN 0-7110-2059-0. ^ "Brief Encounter". rottentomatoes.com. 26 November 1945. Retrieved 10 March 2016. ^ Dixon, Thomas (2015). Weeping Britannia:Portrait of a Nation in Tears. Oxford. ISBN 978-0-19-967605-7. ^ A quote from the final scene in the 2014 documentary Altman. ^ "TV - 'Brief Encounter' - Burton and Miss Loren Portray Lovers on Hallmark Film at 8 - 30 on NBC - Article - NYTimes.com". nytimes.com. 12 November 1974. Retrieved 10 March 2016. ^ "Votes for Brief Encounter (1946)". British Film Institute. Retrieved 28 January 2017. ^ Handford, Peter (1980). Sounds of Railways. David & Charles. ISBN 0-7153-7631-4. ^ "Greer Garson Stars in "Brief Encounter" On Academy Award--WHP". Harrisburg Telegraph. 16 November 1946. p. 17. Retrieved 14 September 2015 – via Newspapers.com. ^ Billington, Michael (18 February 2008). "Theatre Review: Brief Encounter". The Guardian. London. Retrieved 26 April 2010. ^ Cheal, David (8 February 2008). "Brief Encounter: 'I want people to laugh and cry. That's our job'". The Daily Telegraph. London. ^ Noel Coward's Brief Encounter to Open at Studio 54 in September BroadwayWorld.com Retrieved 12 September 2010. ^ Kneehigh Tour Dates  Retrieved October 2013.